In November, our team continued to make features and improvements. Before diving into tech update, take a look at Selected Integrators webpage which shows a list of the companies that use our solutions for their customers, integrating our technologies into sophisticated streaming workflows. We recommend contacting these companies if you need help deploying or setting up our products in your environment. A new version of Larix Broadcaster for iOS is now available in AppStore. Several significant improvements were made. Larix Broadcaster is based on mobile broadcasting library and its source is included in our mobile SDK. RTSP republishing was added into Nimble Streamer in addition to existing RTSP feature set which already includes transmuxing of incoming streams and RTSP playback. DVR time fragments requests were added to support EPGs and similar playback scenarios. ABR recording and playback is also supported now. WMSPanel API now has DVR control API capabilities to allow you to automate your streaming scenarios. Speaking of WMSPanel API, it now has multiple streams real-time status API method for those customers who have multiple streams to be tracked simultaneously. 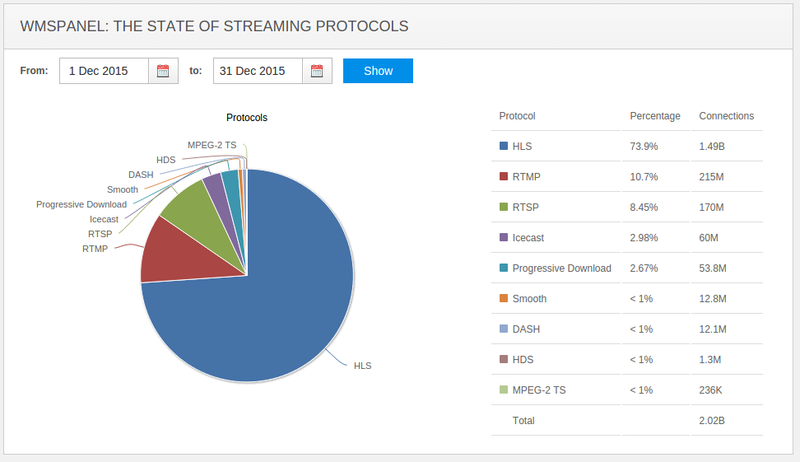 shows the growth of MPEG-DASH which overruns HDS, and increase of RTSP share after adding RTSP playback and re-streaming into Nimble Streamer. RTSP feature set is a popular among Nimble Streamer users that are performing in live streaming, especially directly from cameras. There are cases when the live stream needs to be delivered to edge or other origin servers in order to perform load balancing and build robust infrastructure. For this case we have streams republishing support. It previously had RTMP support, and now it allows republishing RTSP. If you have RTMP, RTSP or MPEG-TS incoming stream, you may publish it as RTMP or RTSP to any location that supports those two protocols. UI for republishing RTMP and RTSP. Please refer to "RTMP and RTSP republishing via Nimble Streamer" article for set up details. Contact us if you have any questions related to this or similar functionality. The metrics calculations are based on nearly 1.4 billion views. The stats are collected from 1800+ media servers (including Wowza, Nimble Streamer and Flussonic). HLS share is at 69% share with slight decrease of RTMP and Icecast numbers. Check the chart below for more. This article is obsolete. Please use this latest deployment automation feature to add pre-configured Nimble Streamer instance in your WMSPanel account. There is wide range of tasks associated with streaming of media content in MPEG-TS over UDP in corporate networks. Nimble Streamer is capable of transmitting stream to multicast network, DVR Storage, transcoder or presentation monitor. 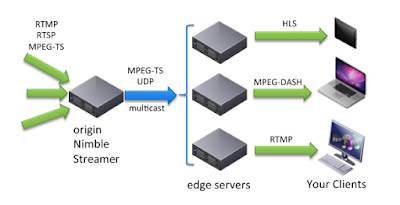 In some cases it is necessary to transmit multiple programs in a single MPEG-TS stream. This activity is often related to private networks (hotel, enterprise), when using a hardware decoder that supports only MPEG-TS as input. 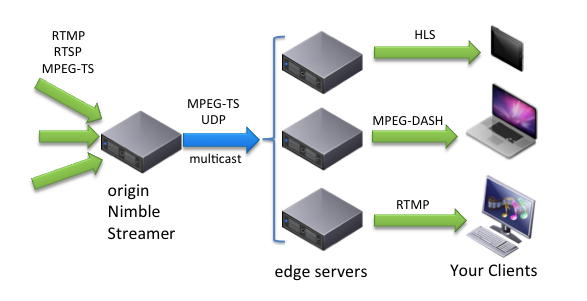 Packing multiple RTMP, RTSP or MPEG-TS streams to single MPEG-TS UDP stream. 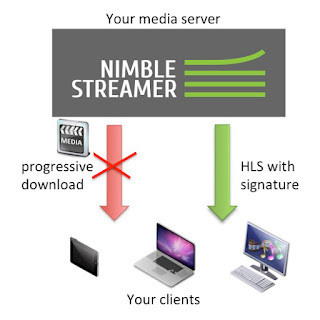 The distinction of Nimble Streamer is the ability to transmux up to 256 RTMP, RTSP and MPEG-TS streams into single multi-program MPEG-TS UDP stream. For each incoming stream the unique PMT PID, Video PID and Audio PID values are assigned. 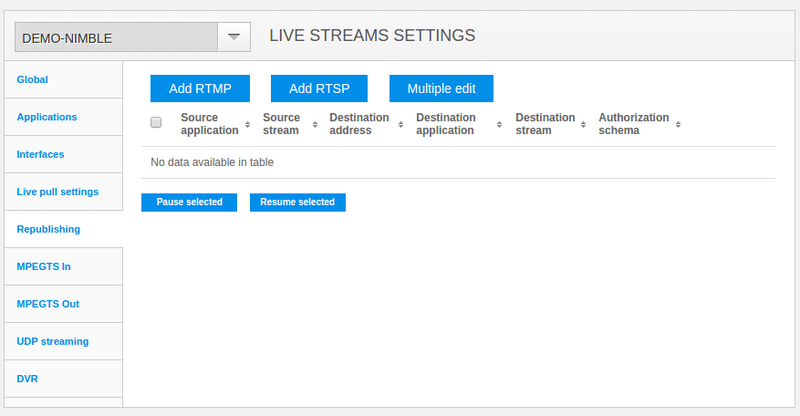 You can take RTMP, RTSP and MPEG-TS streams from any sources, transmux them into a single UDP MPEG-TS stream and transmit via multicast. Many broadcasting companies use remote media storage as a convenient way of organizing video-on-demand (VOD) streaming infrastructure. The main advantage of dedicated storage is having all files located in single repository, instead of maintaining multiple copies across all edge servers, and save costs on multiple large hard disk drives. The second advantage is ability to organize centralized backup and failure recovery and convenience of managing content, such as adding, removing or replacing media files. This is why storages like Amazon S3 are extremely popular. Remote storage support is now available in Nimble Streamer. It works with any server, that supports file access via HTTP protocol with HTTPS as an option. Nimble Streamer support HLS, and MPEG-DASH transmuxing as well as progressive download from remotely stored media content. Advanced caching techniques allows Nimble to effectively stream files, those size exceeds available file system capacity. Nimble Streamer is extremely lightweight and powerful. You can use any cheap virtual machine to stream thousands of files. All you need to do is specify link to your media on remote server via WMSPanel web interface. Security and billing are often considered as most valuable tasks for every media business. It's hard to imagine a company that doesn't care about protecting its own content, which in fact underlies company's gain. Unprotected content can be used by other people for commercial purposes and that actually means missed profit for the content owner. WMSPanel team provides their customers with set of paywall features for Nimble Streamer and Wowza, those are dedicated to solve the above tasks. The best-known feature is hot-linking protection, which allows to protect specified links from re-streaming and further re-use. Briefly, media URL is accompanied with special signature, which contains information about IP address of viewer and period of time the URL is valid for. So, protected URL can't be used to retrieve media content from any different IP address and expires after predefined period of time. Perfect! However sometimes, our customers report, that hot-linking protection is broken, because they've seen an application, playing their protected streams. The application's name is usually Kodi, SimpleTV or PlaylisTV, but that isn't a full list. Reported case looks like re-streaming, but in fact it's not. Those applications don't produce media URL, but scrape it from a web page, which is in most cases accessible for everyone. Roughly speaking, they act as "man-in-the-middle", requesting web page from viewer's IP address, taking URL from that page and pasting it inside its own media player. So, nothing to worry about? Not exactly. WMSPanel team continues analyzing the state of streaming protocols. June had less views than May but the same share of protocols. The metrics calculations are based on nearly 1.3 billion views. 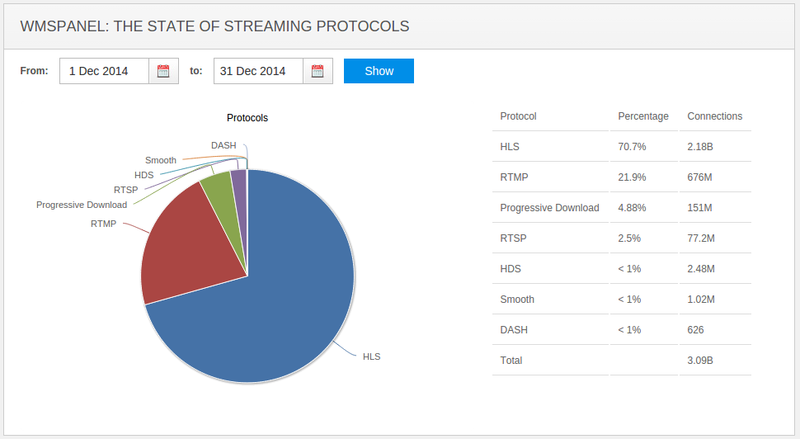 The stats are collected from 1800+ media servers (including Wowza, Nimble Streamer and Flussonic). As we introduced HTTP origin for "CDN-friendly" outgoing streaming, part of outgoing connections is not shown in monthly stats. HLS share is down at 68% share with slight increase of RTMP, Icecast and MPEG-DASH numbers. Check the chart below for more. The State of Streaming Protocols - June 2015. Our customers build their own streaming infrastructures using Nimble Streamer in order to have low cost and reliable delivery networks. However, sometimes they need to reach audience which is located in the regions where they don't have their coverage yet. This is where they start using 3rdparty CDNs. Nimble may serve as an origin for these networks and provide streams for further re-streaming. Some CDNs may require streams URLs without any variable parts, such as sessions identifiers. 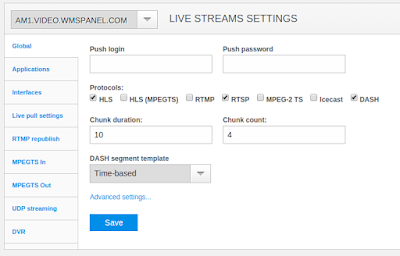 Nimble uses nimblesessionid parameter to track viewers' sessions but it allows skipping that. Let's see how Nimble Streamer helps handling it. 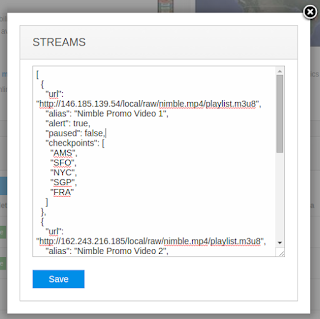 WMSPanel collaborates with Nimble Streamer via sync-ups exchange. Nimble is sending statistics data to WMSPanel service for further processing and gets responses. This scheme assumes that a Nimble Streamer media server is constantly online and it keeps sending sync-ups continuously. Internet is a very complex network and sometimes some of sub-networks and entire countries become invisible to other segments. In this case our server will not be able to send data and this might cause data losses. Nimble Streamer now has proper improvements to prevent data losses and recover from disasters like that. Here is how it works now. When Nimble Streamer is launched after installation and registration in WMSPanel, is starts sending sync-ups. If wmspanel.com is not available for some reason, Nimble still tries to reach it, trying to send sync-ups for several times. If the service in unavailable for a long time, then the delta for the most useful daily statistics are accumulated on the server side. This is the most critical data often used for billing customers, that's why it's saved and recovered. So your critical stats are always safe and you can rely on WMSPanel daily reporting. Dispersa streams availability monitoring is widely used by our customers around the globe. Many of them monitor dozens and even hundreds of streams. So in addition to having monitoring alerts API to automate notifications, people need a way to make bulk edit of their streams as least from web UI. That's why we introduce multiple edit for Dispersa monitoring entries. It allows setting the streams and their monitoring behavior. Go to Monitoring top menu to see list of your streams. Here you can see Multiple edit button. Clicking on it you see a dialog with a formatted text representing current settings. checkpoints is the list of checkpoint where the stream is checked. It uses checkpoint 3-character aliases or server ID in case of private checkpoint. So, setting up these options you can control all stream in your list at once. Let us know if you think of any other improvements your business might need from Dispersa. MPEG2-TS is one of the most popular streaming protocols used by various types of businesses. It supports several streams types and allows carrying multiple programs within one stream. This is why Nimble Streamer had support for transmuxing MPEG-TS into HLS streams for a long time. Now it's time to step forward and improve MPEG2-TS feature set with a few great capabilities. 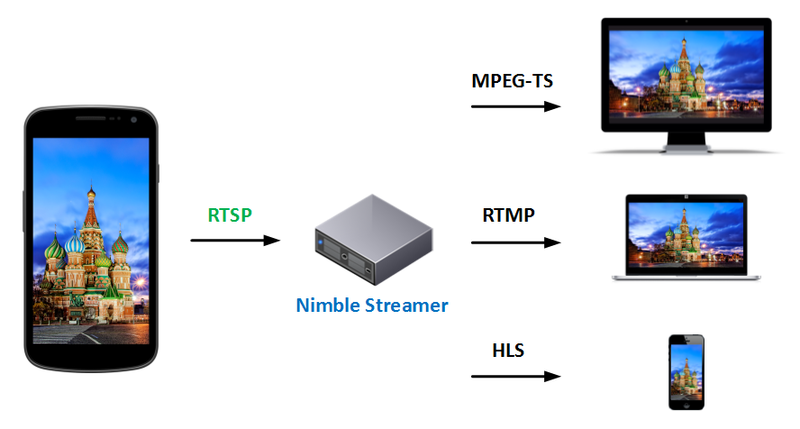 Examples of scenarios for MPEG2-TS streaming via Nimble Streamer. Supported video formats are MPEG1, MPEG2, MPEG4 and AVC. Supported audio formats are MP3 and AAC. For the outgoing streams protocols that don't support these formats, only the respective subset is used for transmuxing. The outgoing streams generated from MPEG-TS may be used in adaptive bitrate (ABR) streams produced from other protocols like RTMP and RTSP. Let's see how it can be set up and used via WMSPanel.